After our last two blogs on the “ 10 Commandments of Customer Service” I thought it appropriate to share a customer service story. Chip and Amy run an auto repair business called Auto Craftsmen in Montpelier, Vermont. Their story is an excellent example of how to build a business by providing superior customer service and wowing the customer. Currently Chip and Amy have three technicians (who are not called mechanics; in auto repair these days, the work is predominately computer-based and technical) as well as Marc, who is the service adviser. Chip is foreman and Amy looks after marketing, finance, and community education. Chip, who is a fabulous technician, commenced the business in 1980 and ran it very successfully as a one man show. Amy joined the business in 1995 and spent the first eight years as service adviser. During this time she was an avid learner, watching repairs and studying tech magazines. She wanted to thoroughly learn the business to ensure the conversations she had with customers about their problems were meaningful. As service adviser, she was first co ntact for most customers. In 2001 they purchased new equipment, expanded the premises, and hired more technicians. All they needed were more customers! Amy sourced out Ron Ipac from Cinron Marketing. Ron had built a business teaching auto repair shops how to grow their businesses. Many of their marketing ideas came from this coaching relationship. They still work with Cinron and are now part of the “Pinnacle Group,” which is a group of 80 independent auto repair shops that receives specialized advice from Ron and has regular group meetings to share ideas and initiatives. When you call Auto Craftsmen, Marc answers and you are immediately impressed with the friendly and informative responses to your questions. Upon entering Auto Craftsmen, you instantly realize that this is not your average auto repair shop. The waiting room looks fabulous, clean, comfortable, and classical music plays. You are given the Auto Craftsmen difference book to browse while you wait for Chip to meet you for your no-obligation initial appointment. If you haven’t been wowed yet, the interview with Chip will do it! Chip’s knowledge of vehicles is second to none, yet you do not feel overwhelmed as he takes you through the process at your speed, thoroughly educating you to be able to make informed decisions. 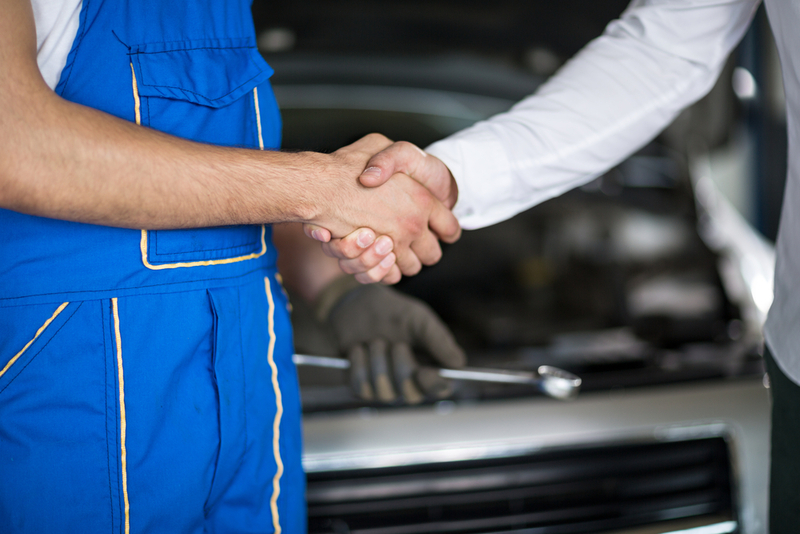 This builds trust right from the outset and you feel empowered with your new-found knowledge of your vehicle and safe operating tips. A road test follows where Chip will explain reasons he is testing things such as steering, brakes, and acceleration. On return to the office, Chip provides written recommendations that are based on your specific circumstances, your vehicle’s current condition, and annual anticipated mileage. He also takes into account how long you propose to retain the vehicle. You are given a folder to take home and you can discuss these recommendations if there is another decision-maker involved. If you proceed and book the appointment after the work is completed, you receive a follow-up call to ensure any problems were fixed. If they weren’t, you are invited back to have the issues rectified at no charge. The communication beginning at the initial telephone call, then when you step into the waiting room, right through the entire process, and to ongoing regular customers, is excellent. No wonder the majority of their new customers are referrals from their already raving advocates! Auto Craftsmen’s monthly newsletter, available electronically or in hard copy, has safety tips, recipes, jokes, and it introduces you to their specials, such as a free winterization check or a brake special where brake pads and labor are free. On a regular basis they have promotions that give back to the community. Toys for Tots and The Community Food Shelf are their two favorite local charities. These promotions provide win/wins or “double wows”: customers receive a super-special discount for their contribution, and a worthwhile cause and the community’s needy also win. Their current winter promotion: customers can provide a toy or a check to Toys for Tots for $25 and receive a free vehicle winterization valued at $75. Chip and Amy are passionate about educating their customers and the general community about their vehicles, especially the safety aspects. They are also making us all aware of the knowledge and expertise required to be a technician and how hard they work to ensure your vehicle is operating safely and efficiently. Amy provides education classes for school children, driver education classes, and she speaks to many groups on auto safety. Amy’s next goal is to have a TV program called “Amy’s Garage” that will take her passion of educating the public to a new level. Chip and Amy are not only building a great business by wowing their customers, they are providing the general community with an excellent education service on auto safety that is saving lives.